Judging from conservative rhetoric, the debate over health-care reform is in truth a fight over the future of American democracy and capitalism. Stopping the health-care bill is being described as an essential step toward restoring America to its rightful owners and rightful course. 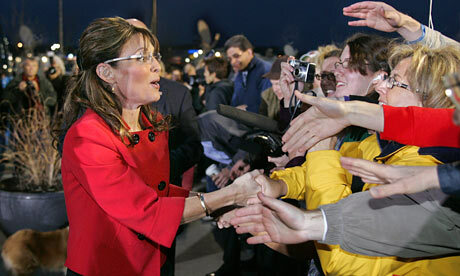 Sarah Palin, the former governor of Alaska, made a more personal contribution to the hysteria. Health care reform would not merely threaten the foundations of America, she warned, it would lead to government-mandated abandonment of our loved ones and family. While that’s some pretty impressive demagoguery, Palin, DeMint and others are mere pikers compared to the master of the genre. To appreciate true genius in explaining how government health care will destroy all that is good and Godly about this country, you can’t do better than the Great Communicator himself, Ronald Reagan. As if you hadn’t heard, a gaggle of American conservatives is stridently charging that pending health care reform legislation will institute a mechanism for euthanizing selected members of the handicapped and elderly populations–that it would, in Sarah Palin’s formulation, establish “death panels.” It’s true that H.R. 3200, the bill that will eventually come before the House of Representatives, is still a work in progress. It has already been amended by three separate House committees, while two Senate committees are working on drafts of their own. All of the provisions to be included in the final bill are not yet known, but one thing is certain: There is not a single statement in the voluminous number of pages under study that contains the slightest consideration, no matter its remoteness, of death panels, euthanasia, or any such fearsome concept. In reality, the legislation simply calls for the reimbursement of physicians who counsel patients on end-of-life decision-making–counseling that is already required by a 1990 law and that is now covered by many insurance plans. But the specifics of the present bill are irrelevant to the loony conversation the right has sparked during the August recess. After all, even if there were some provision before Congress that could conceivably be interpreted as establishing a “death panel,” centuries, if not millennia, of established medical ethics (in addition to existing U.S. law) would prevent its actualization. In the midst of this crucial debate on the future of health care, somehow, the proponents of the euthanasia talking point seem to have forgotten everything we know about the practice of medicine in America. Sarah Palin with Trig out on the campaign trail during the 2008 Presidential race. No Sarah, it was never about Trig or even about your “concern” for the elderly in our society. In typical and consistent fashion, you again showed America and indeed the whole world that not only is integrity far from you, but deceit, deception and disinformation are the hallmarks of your very being. It would be funny were it not cold-hearted and incendiarily unbecoming for you to use a medium through which you would not have to answer any questions to forment hate and falsehood. Rather akin to your hypocritical display of “patriotism” (in accusing then candidate Obama of “palling around with terrorists” while you may actually be married to one) during the last presidential elections. Eunice Kennedy Shriver devoted her life to improving the welfare of the mentally disabled and founded the Special Olympics as a showcase for their abilities. It fills me with sadness to think this change might not have been necessary if we had known then what we know today — that 75 to 85% of the retarded are capable of becoming useful citizens with the help of special education and rehabilitation. Another 10 to 20% can learn to make small contributions, not involving book learning, such as mowing a lawn or washing dishes. Only 5% — the most severely retarded cases — must remain completely dependent all their lives. If only Rosemary had been born forty years later, Eunice thought, things would have been different for her. This led Shriver to devote her life to such children and their families. She lobbied her brother, the President, to pour $120 million into research. The family foundation donated millions to care centers and medical facilities. As a Senator, her brother Robert successfully prodded Governor Rockefeller to improve (at least for a time) the horrid conditions at state mental institutions in New York. And most of all, she started the Special Olympics out of her own backyard. Is Sarah Palin writing well researched, grammatically correct entries complete with footnotes on Facebook?? Just before midnight, a “note” was posted on Sarah Palin’s Facebook page titled, “Concerning the ‘Death Panels. '” Predictably, the media latched onto it and reported her thoughts. However, there’s a problem: there’s no way in hell Sarah Palin wrote it. Wow, and the public thought she wasn’t educated enough to be President? That is some of the most well researched and thought out material I have ever read. Thanks Sarah. Exactly! Thank you Marvin Settle. Thank you very much. Dr. Ezekiel Emanuel is the Chair of the Department of Bioethics at the Clinical Center of the National Institute of Health. Dr. Ezekiel Emanuel, the health-policy adviser at the White House’s Office of Management and Budget — who has been caricatured by conservatives as a “Dr. Death” seeking to pull the I.V.s out of your grandparents’ arms in the name of cost containment — is not happy. Asked by ABC News in an interview about the thoroughly discredited claim by former Alaska Gov. Sarah Palin to paint his philosophical writings as evidence — along with a provision providing optional end of life counseling in the House Democrats’ health care reform bill — that President Obama wants to set up “death panels” to deny medical treatments to seniors and the disabled, including her son Trig, Emanuel, brother of White House chief of staff Rahm Emanuel, does not hold back. Emanuel says as an oncologist he’s had hundreds of discussions with patients about what to do when treatment doesn’t work. He notes that his sister has Cerebral Palsy, so he is not without personal sympathy for those with disabilities.